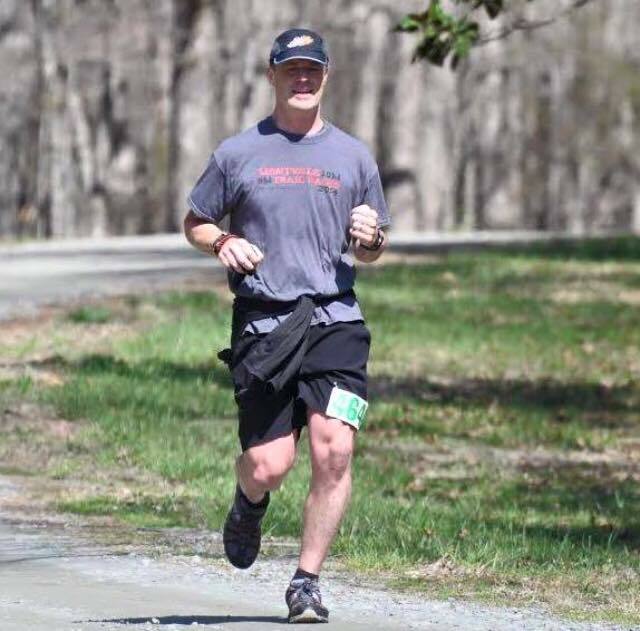 I have not done a race report in a long time, but people ask me about some of the races, or other adventures that I do, and want to hear details about them. 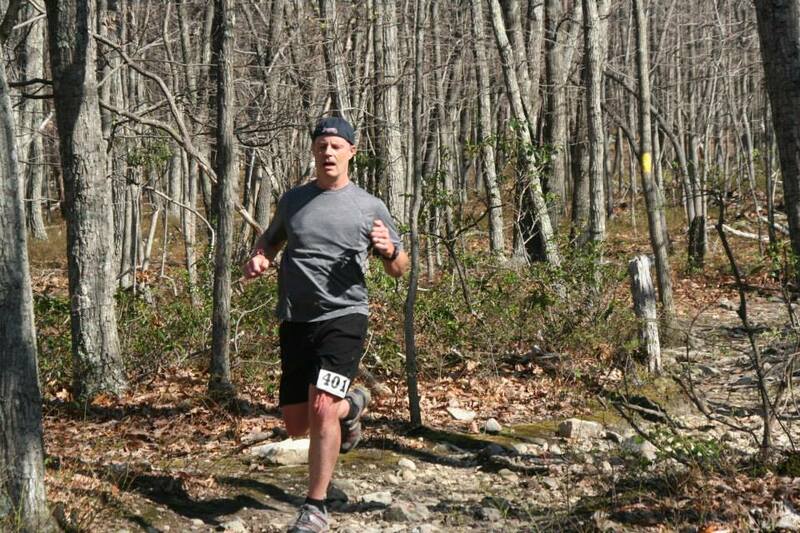 This is about the Seven Sisters 25K trail race in Montreat NC. Many of you saw my Strava and Instagram posts, so the pictures are the same. First, the Montreat and Black Mountain, NC area is a fantastic area and one of my favorite places to visit. 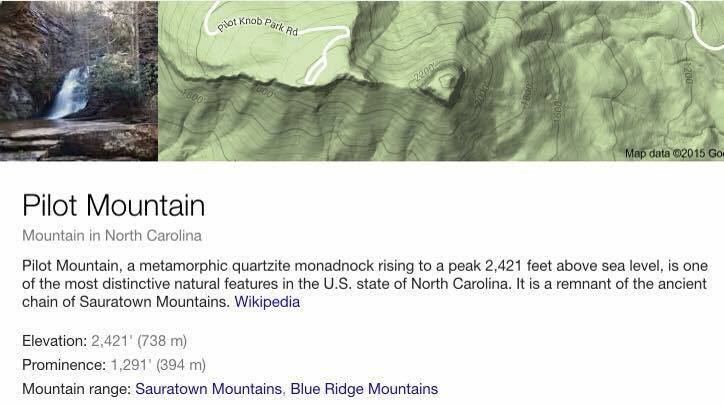 It is close to Asheville, in Western NC. 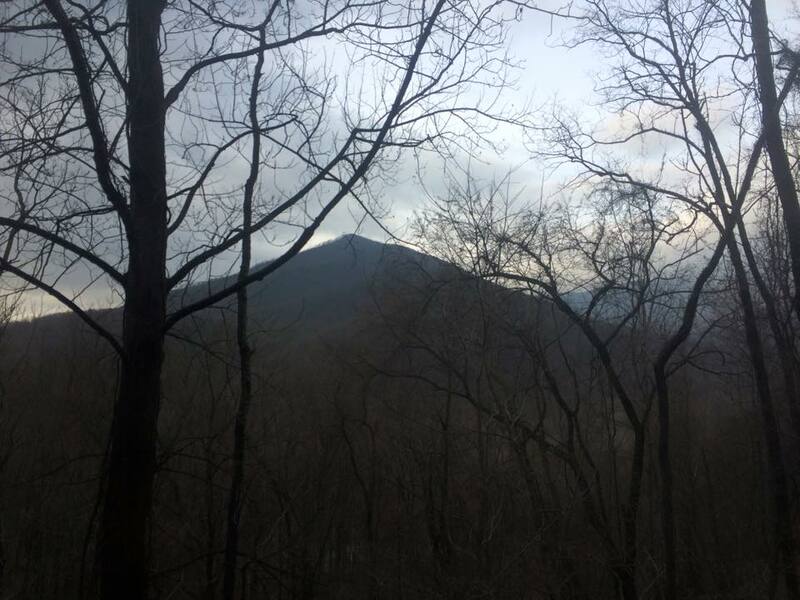 Just visiting Montreat and Black Mountain, without hiking the trails is amazing, but the trails and mountains are a huge part of the area. This is the video from Tanawha Adventures, who puts the race on. 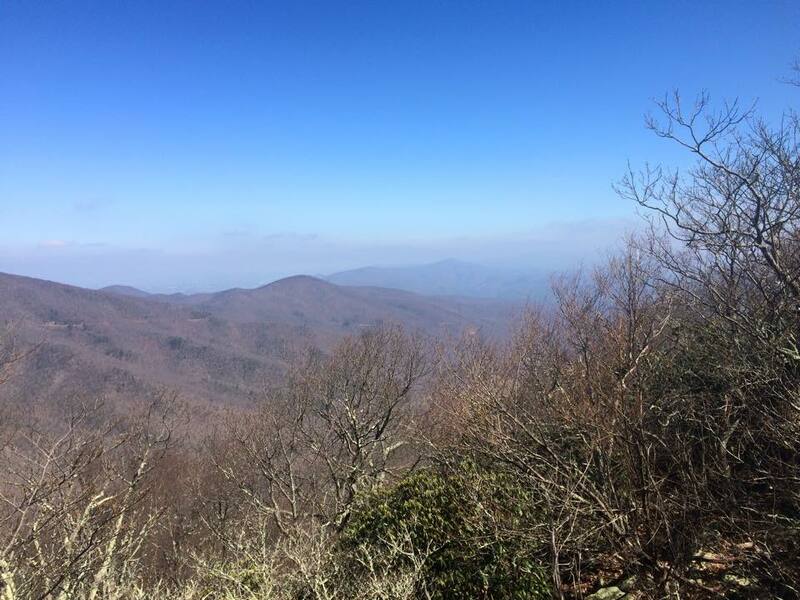 Copy and past from above website: “The Seven Sisters 25k is a monstrous mountain of a run around the East and West ridges of the Montreat Wilderness! 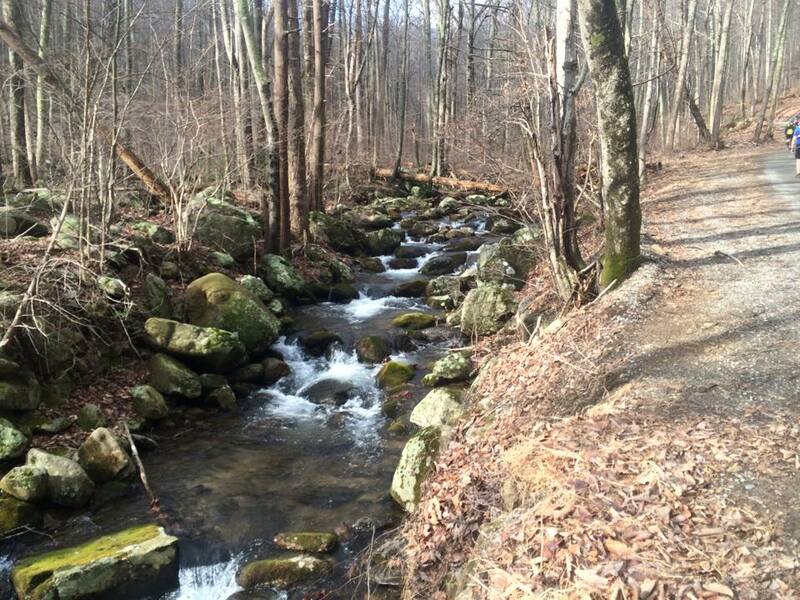 This route is a Western North Carolina classic, but it will be the first time it will be held as a race. 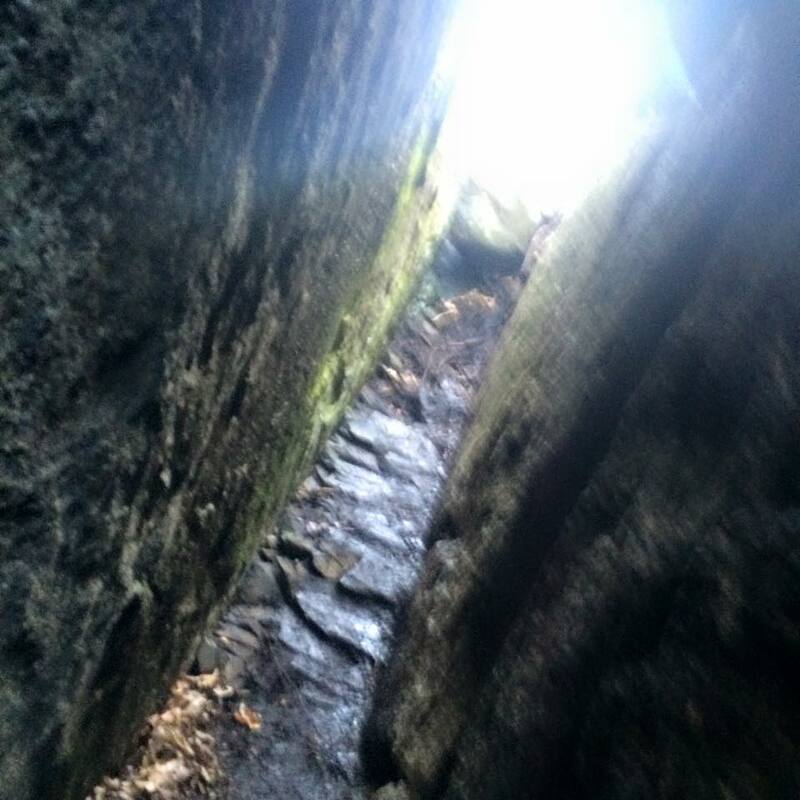 Although short in distance, this route will leave you in awe at its beauty and its difficulty. 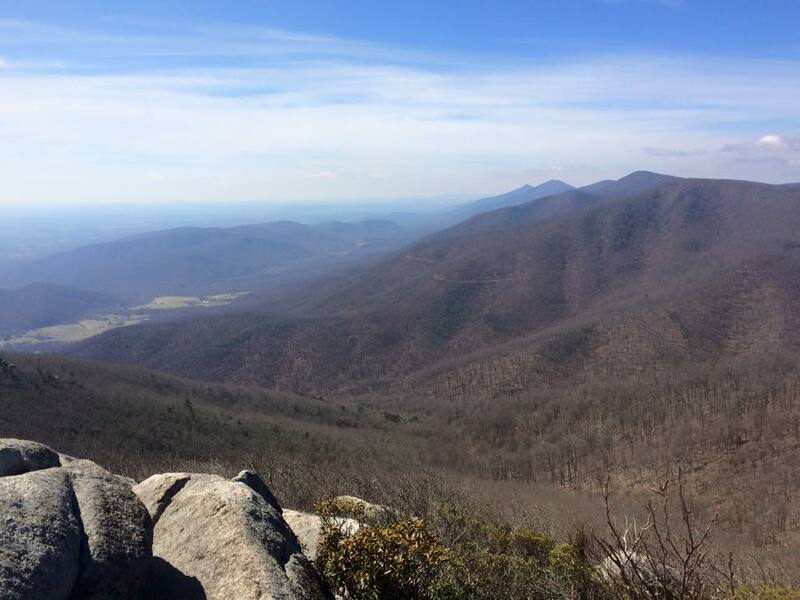 The route passes over multiple peaks and overlooks including; Lookout Rocks, Rocky Head, Graybeard, Rattlesnake Rocks, and of course the Seven Sisters themselves along the treacherous West Ridge Trail. Come prepared to run this beast! 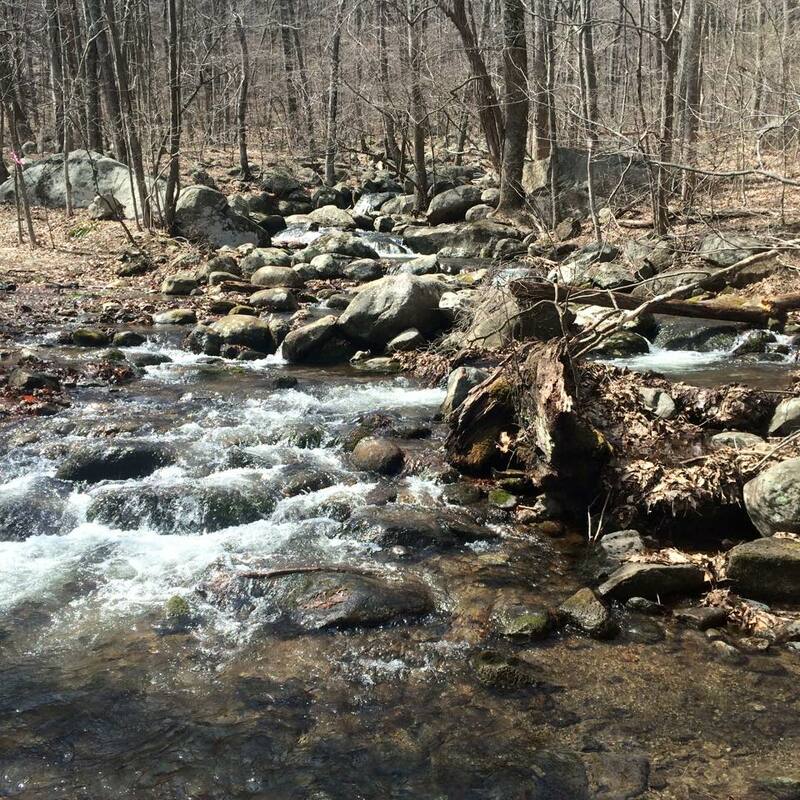 Prior Trail Running Experience Required to Participate! There was a scare before the race, that we were not going to be able to run the whole course. The weather the day before the race was horrible, with major rain and tornado activity. I saw one report say that Western NC had not received that much rain in over 100 years. There was a threat of snow and freezing rain on race day. The race director had 3 different options of what could happen. The race was going to go on, but the worst option was a 6 mile race! I was horrified of the chance of anything, but the full 25K loop. Thank God the weather did not get too bad and we had the full course. This is only the second year of this race. The first year was shortened due to snow and ice. I thoroughly enjoyed the race and am very happy with it. It was not that I had a great finish time (I was middle of the pack)…it was that I had a great time, as in fun. Between it being in the amazing Montreat/Black Mnt area, the atmosphere, the amount of technicality/climb/elevation/views and the weather, it was a perfect fit for me. I felt great the whole way and was able to enjoy it all. I stopped several times to take pictures, but pushed myself hard, otherwise. It is a tough course and race. A lot of technical trail with a lot of climbing. 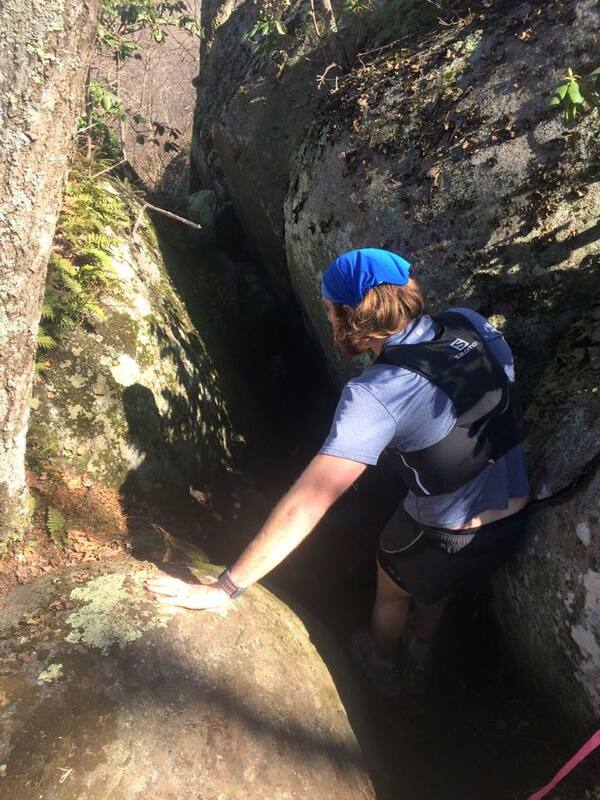 I was able to do a lot of long climbing training runs/hikes recently, like Day Creek/Black Horse Gap, Priest/3 Ridges, Grandfather and Linville Gorge..I am sure that helped a lot. While not an ultra, it runs like a mini ultra. Does not compare to the Promise Land 50k and other ultras, that some of my friends are doing this weekend and I have done in past. It is just hard enough and just long enough to be fun..if you know what I mean. After .5 of pavement you enter the single track of Rainbow Road(trail) and Lookout trail. This part has some portions that are steep wooden steps, that I did not get a picture of. There is some of that on the video. The rest of the course is climbing for the most part, with small descents in the mix, until you get to mile 9-top of Greybeard. The mile 8 to 9 climb to Greybeard was the toughest part, I thought. There were 2 small out and backs to views. Most of the last downhill from mile 9 is very technical. The last mile or so of trail is easy, then the last mile or so of road is super fast and easy. I posted some pictures of the trail being very wet, but the trails were in great shape, considering the prior weather. The wet did not slow me down much, maybe some. The temp at the start was around 41. I am a cold weather runner, so this was ideal for me. On top of that, there was a light snow, in the high elevations, for around half the race… that was another ideal for me. To start off with, I had a short sleeve shirt, a light long sleeve shirt and a Houdini shell on. I had another Houdini in the hydration pack. I had way too many clothes with me (4 top layers and shorts). The theat of snow, freezing rain and cold temps caused me to over pack and wear. I took off the Houdini and the long sleeve short after a couple miles. I ran in short sleeve shirt and shorts the rest of the way and felt great, even though the temp may have been in the high 3Os at times. 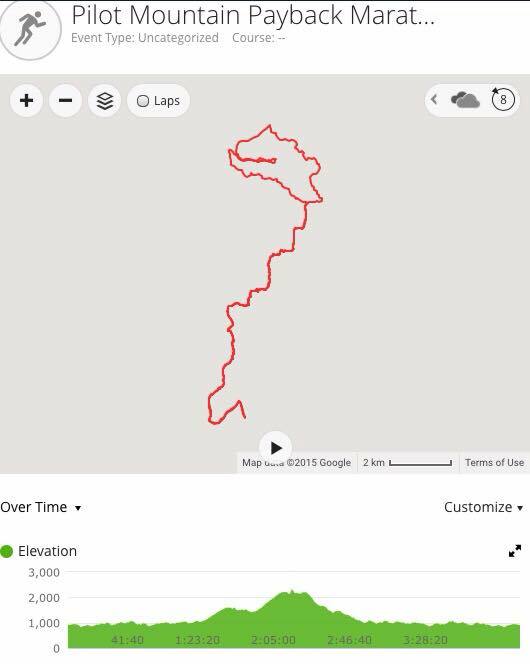 Elevation profile of race..mile 9 was the highest peak-Greybeard 5404 feet. Mile 9 to 12 were still very technical and not very runnable, even though down hill. Mile 12 to 13.5 or so were smooth downhill trail. The last .5 to 1 mile is fast downhill pavement. You can see from the website and video, that there are several views and they can be incredible. We had a few good views, but most of them were foggy and cloudy. That did not make the race any less great. While it is somewhat comparable to the GrandFurther 25K in Boone NC, it is not as technical as that course. A lot of this is runnable, if you have the endurance to climb that much while running technical trail. I averaged around a 15 minute pace. I highly highly recommend the race and make sure you take the weekend to spend some time in Montreat and Black Mountain. Trailhead Restaurant/bar, Dripolater coffeehouse, Take a Hike outdoor store, Epic Cycles bike shop and Vertical Runner running store (where packet pickup was) is a few of the local places that we have been to and like a lot. There are a few breweries and Cider places…Pisgah, Black Mountain and Lookout, to name a few. Maria did a nice 20 mile bike ride, while I was racing, called the North Fork. Sunday, we did a short ride into Montreat and back. We would have done the Town and Country bike ride, but the storm had caused an issue on that route. The one negative is that the registration shirt was awful, for me. Please do a graphic of the 7 Sisters plus Greybeard mountain range, next time, RD. We did get a nice pair of 7 Sister logo (just the words) socks as a finisher award. Maria took the finish pics. 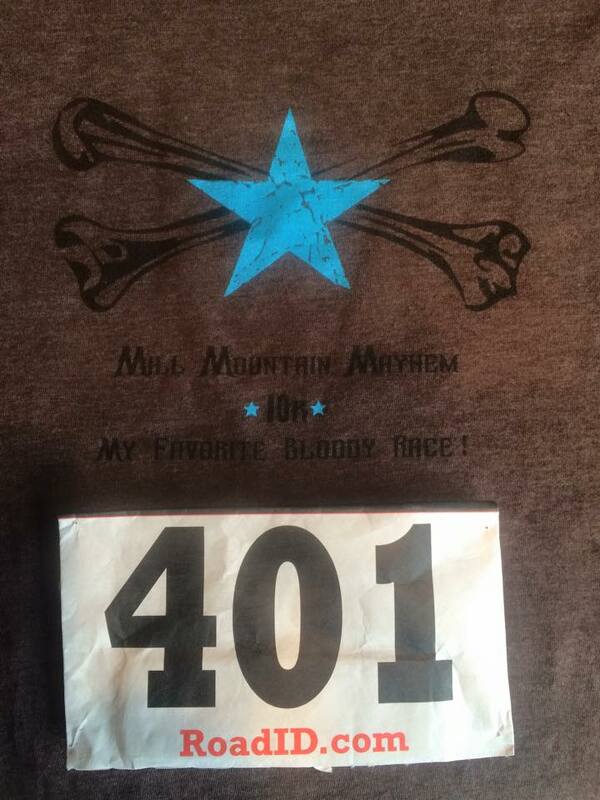 This race always comes at a bad time…..it’s always the week after Blue Ridge Marathon or Promise Land. I rested all last week , in hopes that I would recover enough to run the 10k at a decent pace. I had originally registered for the half, but decided to step down to the 10k…due to running Promise Land last week. I had never ran this 10k before, so I really didn’t have much to base a goal time on. I have ran the half twice. I decided a goal would be 55 minutes, based on other’s past performances. I felt fine before the race, but you never know…especially after doing a tough 50K 7 days before. I ran hard for around 2 miles, but quickly realized that I did not have it. I had nothing. I slowed down, then slowed down some more. I walked a lot. It was pretty pitiful…for me. I was just trying to get it over with and finish it. My early hopes were to place, then by mid race I just wanted the completion points. It was really frustrating, but I made the best of it. I crossed the line at 1:08 or so and everyone could see the frustration on my face. I went back down to the trail to cheer in the half marathoners. When they started finishing, I congratulated them at the finish line. That and hanging out with everyone, was the fun part of the day. I finished last in my age group and both of my main competitors beat me, but they were 5th and 6th. The usuals still did great, like Tabitha (second oa female), Robert (first AG despite PL legs) and Doug Falls (second Ag). Carla Cross made her first MJ race this year. She placed third in the half! I have a month to recover until the next race, which is Conquer the Cove 25k or marathon…I have not decided yet. It depends on how I am feeling, the weather and the competition. Promise Land 50K++ (34+ miles) of tough mountain trails..LOTS of climbing..technical..and beautiful. 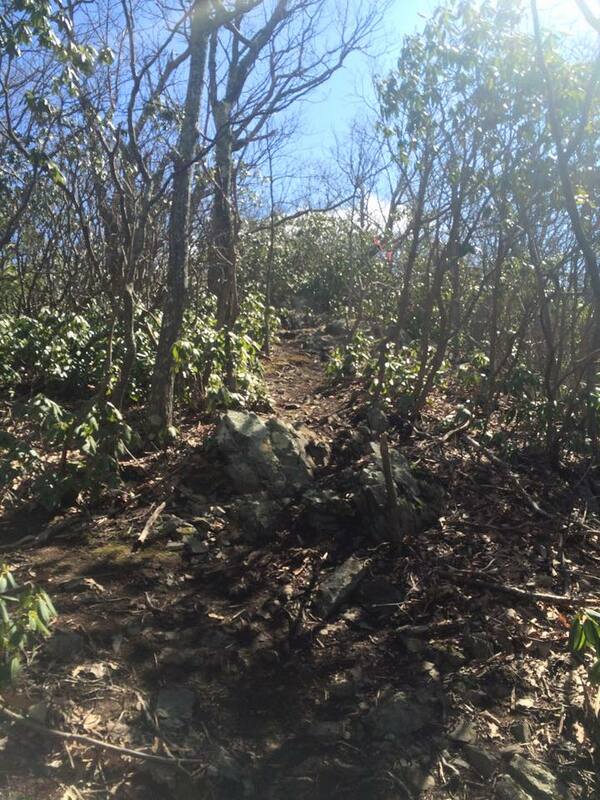 This is arguably the toughest/best 50K on the East coast. Look at the major climbing and elevation change! This was my first 50K, back in 2012, when only barely trained up for a half marathon level. After that 2012 race, my ankles and hip flexors were absolutely trashed and hurting bad. I was happy just to finish the 2012 race under the 10 hour cutoff. I think I ended up with a 9:20 or so time. Moving forward to 2015. I was still not trained up for this. I trained off and on the last part of 2014 at the 13 to 16 mile level. 2015 has mostly consisted of racing, resting, tapering and resting again, so no real training at all. But…that is basically how I roll. I tough out these ultras on half marathon level training. My goal for this race was 8 hours, but realistically I was predicting around an 8:30 time. My prediction was based off of the other ultras I did this year. My time at Terrapin was 7:28, so I figured to add roughly an hour for the 4 extra miles (as Terrapin had lots of climbing, as well). I was also worried about my legs recovering and feeling strong for this race. I have done too many back to back races, without much recovery time. This will be my fourth ultra in 4 months, plus a 15 mile race, a 10 mile race, and a few 10ks. The 10ks were even extremely tough ones! I had a few decent training runs since November, but not many. This race is/was exciting for several different reasons. First, it is an exciting race by itself, due to the toughness, atmosphere, reputation and beauty. This is pretty much a bucket list type race for the East coast, anyway. We camped out at the race site, the night before. Camping out there is an absolute must do. There is a big grassy field that everyone parks and sets their tents up at. Another reason it was exciting was that 2 of my best friends were doing their first ultra…Sara Martin and Robert Drinkwater. I was very excited for them. It was also Brian Lang’s first ultra. 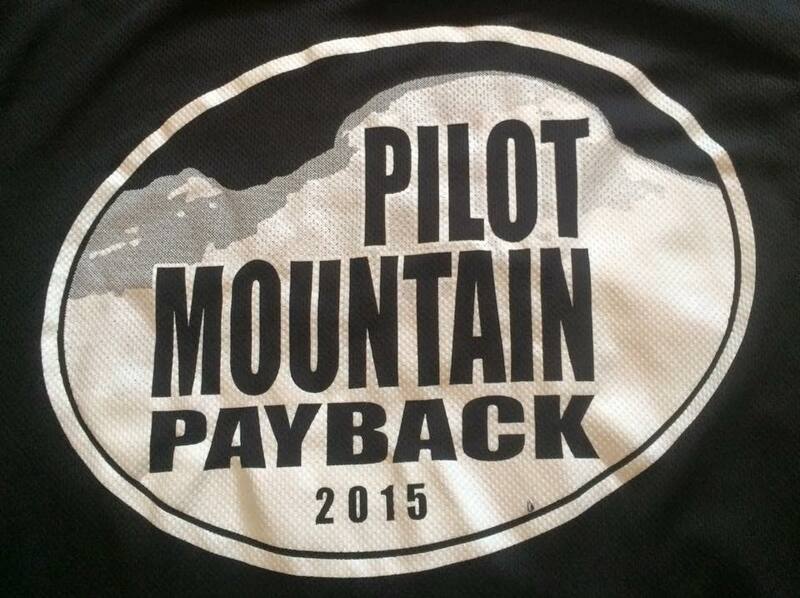 Other friends that raced were Dru Sexton, Josh Gilbert, James Decker, Matt Prescott, David Landes and Caleb Johnson. Gina Gilbert was there crewing and supporting us all day! Race start at 5:30am! I slept ok and got up at 4:30. I didn’t habe coffee, which is an extrem rarity for me. It was in the low 40s I think I had shorts, a short sleeve shirt and a long sleeve shirt on. I ended up tying the king sleeve shirt around my waist for most of the day. The weather is extremely unpredictable here, especially at the different elevations. The race starts at the camp and goes up a gravel road for less than 3 miles. We hit single track after that. There is some climbing, but then you hit an extremely nice part..smooth trail, grassy with views and very little climbing. You climb some more. Early in the race and depending on where we were on elevation, it was sleeting! Yet, it was relatively warm while sleeting..odd. A technical beating downhill is next..then a good stretch of road going downhill. You are now at the lowest point at mile 20. You know there is lots of climbing left. From mile 12sh to mile 30 is called the “Dark Side”. You can see why on the map. I had totally forgot how hard mile 20 to 30 is, especially with 20-mile-tired-legs. This part is going to Apple Orchard Falls and the climb after that. It is very very technical and lots of climbing. This is part of what makes this race what it is..it is beautiful, but comes with a price. I thought I had a chance at a sub 8 race until I got to this part. I was painfully slow. There was a group of 3 college age kids that was near me. One girl (that looked very strong earlier) kept bending over like she was going to puke. Her 2 friends kept waiting up for her, but finally left her after the falls. At some point, later in the race, it got really cold. It had been light raining off and on all day. I had tied my long sleeve shirt around my waist. I put it on for the rest of the race. At times the race felt like a death march. It was brutally slow (for me) and just flat out tough. 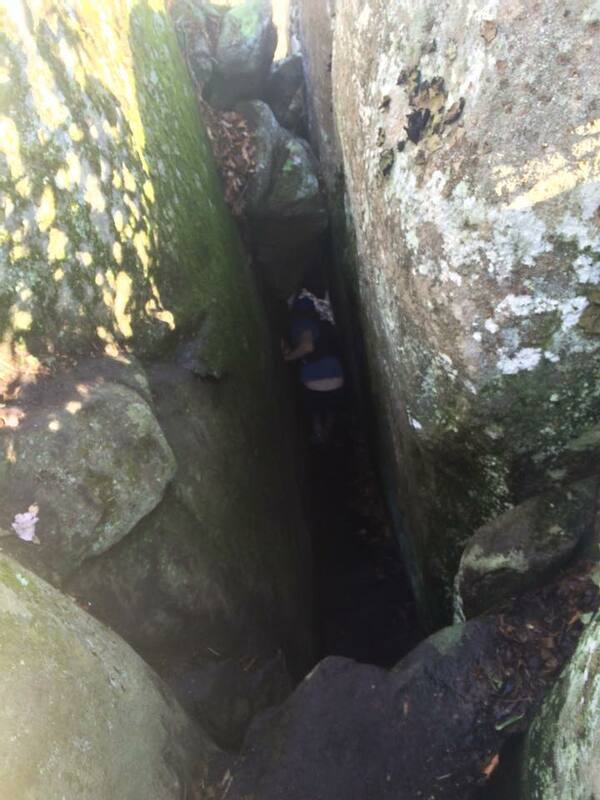 Words cannot really describe how hard that Apple Orchard Falls portion is. 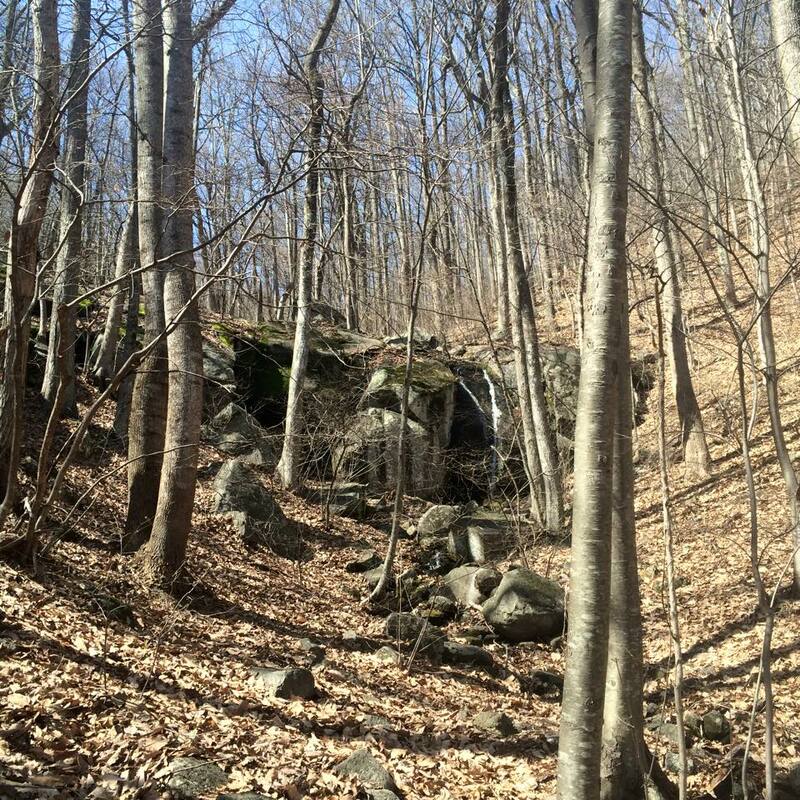 People and myself were moaning and groaning in this section near Apple Orchard Falls. There was more water coming over the falls than I have ever seen. We went through Cornelius Gap aid station twice in the middle of the race. It was great to see Helen MacDermott there volunteering and smiling. 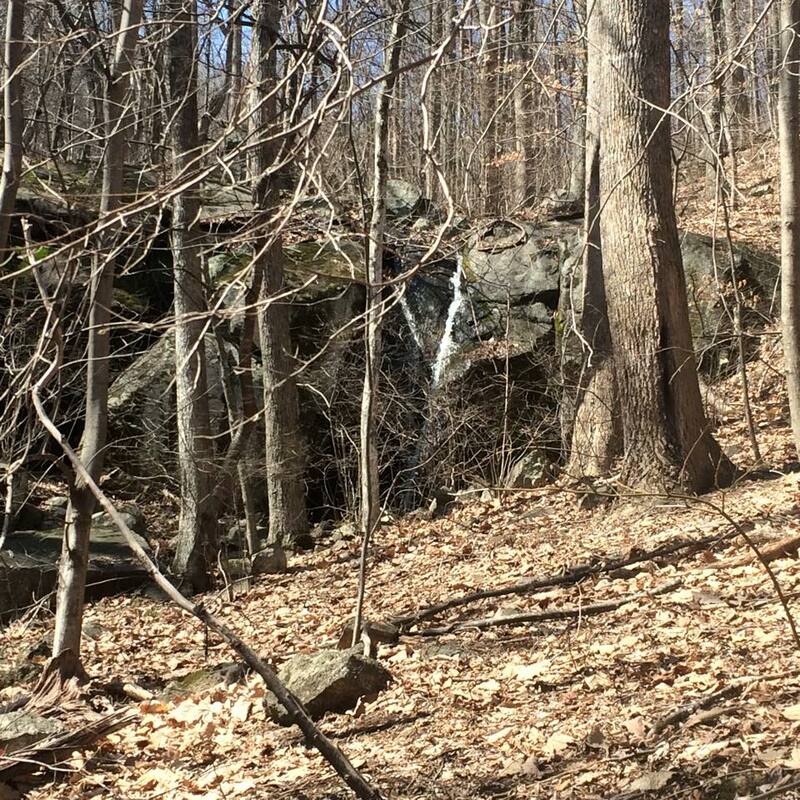 These 2 videos give you a small taste of the Apple Orchard Falls section. I FINALLY made it to mile 30..I had a couple small climbs left, then all down hill on a gravel road to the finish. My sub 8 hour time was long out of reach, but I finished before the 8:30 time that I figured I would be around. Gina was waiting for me at end of the road..see below picture. I don’t look too tired and miserable :). Sara, Robert and Dru were waiting for me at the finish line…always nice to have a reception. Sara and Robert did outstanding. Sara was right at the 7 hour mark and Robert was a little behind her. I was extremely happy for Sara and Robert. Josh was the fastest I think at well under 6 hours. David Landes had a great race at a little over 6. Everyone did well. I am by far the “caboose” of our Mountain Junkie group. I think I was 45 minutes behind the second to last person in our group. I hate that they have to wait on me…and do not expect it. I do appreciate it though. It is a little humbling to finish 2 plus hours behind a few of my friends (not all of them by any means), but that is how good they are and how average I am. I always feel like it is a success just to finish this race. There is so much that can happen. Another great (pure) adventure and one for the books. 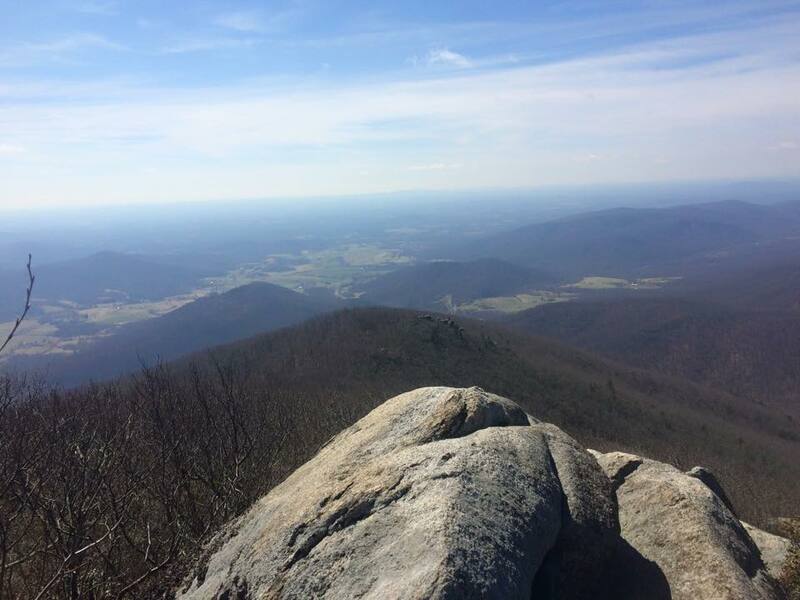 Categories: 50k, get outside, montrail, promise land, Running, Trail, Trail racing, Trail running, Trailrunning, ultramarathon, virginia | Tags: 50k, adventure, get outside, lynchburgtrailseries, montrail, mountain junkies, mountainjunkies, outdoors, outside, promise land, promise land 50k, promiseland, promiseland50k, running, trail racing, trailrace, ultra | Permalink. 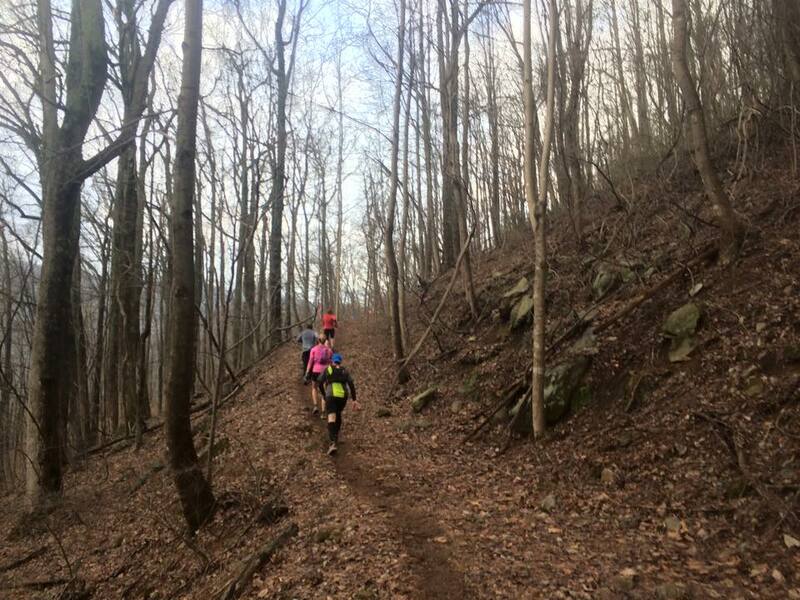 Terrapin Mountain 50K is the second trail ultra of 4 that have to be completed for the Lynchburg Ultra Series. It is billed as a tough race with lots of climbing and it was definitely that. I had set my goal at under 8 hours, due to the fact that it took me 6.5 hours to do Holiday Lake…and I figured it would take me at least an hour more with all the climbing on this race. It also was a mile or so longer. I went by the Aid Station store 2 days before the race and picked up my packet. They give out mugs for the race. I have always wanted one, so I was excited to get it. I was not disappointed! It is a great looking mug. Love it! We left Roanoke that morning at 4:45, so that we could make the hour drive and get there well before 6:30. We had to check in before 6:30. 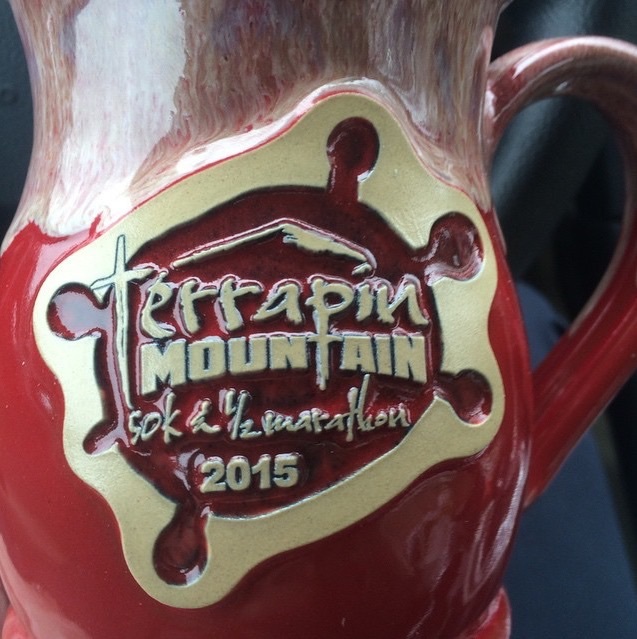 Terrapin also offers a half marathon. Eddie Mann (did the half marathon) and Caleb Johnson rode to the race with me. Other friends there were as follows: Gina Gilbert (there for support, as she is injured), Josh Gilbert, David Landes, Dru Sexton, James Decker, Matt Prescott, John Robinson, and Jeff Jennings (half). Huge shout out to Gina Gilbert. She was there before 6:30 also. She waited over 7.5 hours for all of our friends to cross the finish line and she got pictures of everyone crossing. The race started at 7. The weather was supposed to be nice, so I only had 2 shirt layers on and shorts. The beginning is road and gravel, but it was pretty scenic. There was a rocky creek and several rustic log cabins on farms. 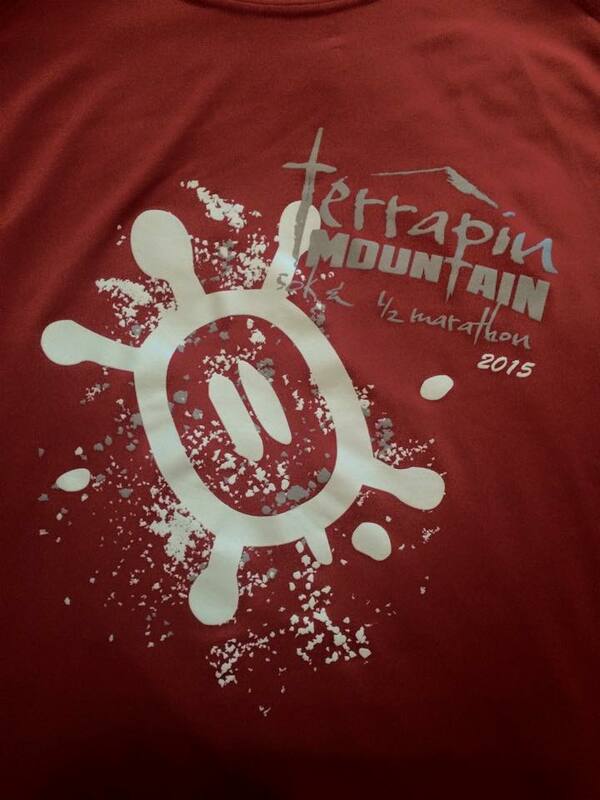 The following picture is of Terrapin Mountain. It is pretty intimidating to see that at the beginning of a 31.5 mile race, knowing that you will have to go over it! We soon hit single track that was a pretty steep climb for roughly 3 miles. The first aid station was at the top, which was mile 4. From there we were on another gravel road, going down hill for around 5 miles. Those 5 miles were the only easy part of the race. The rest of the race was very hard. It seemed like it was climbing ALL DAY LONG..I got to a part in which the lead runners were running opposite me, as they had already done a loop to the top. They were running pretty fast downhill, while I was running slow up hill!. It took forever, but I finally made my way around the loop and by the summit. I finally got to run down that fireroad! At the end of that fire road was an aid station that I had went through earlier. This was mile 22. See mile 22 on the elevation profile below? 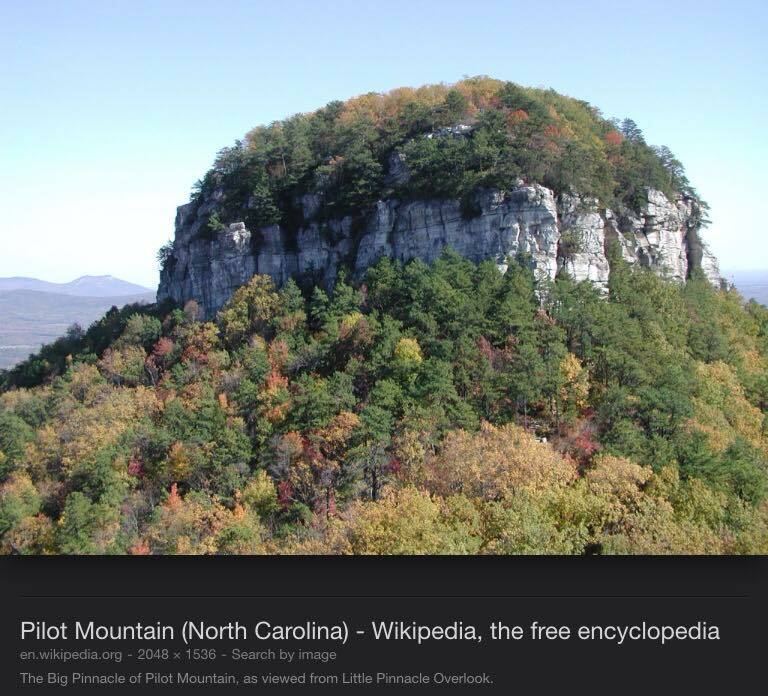 The last sharp top on the right…that was it. Toughest section of the race. Once I went past the aid station, the course was single track again. Now it was a grueling, very steep climb. I was extremely slow on that part. I got to the top and there were some nice views up there. There were 3 parts of the race that you had to do an out and back or loop, so when you got to a certain point, you had to punch your bib. The top was one of the punch points. From there we went on towards “fat mans squeeze”. 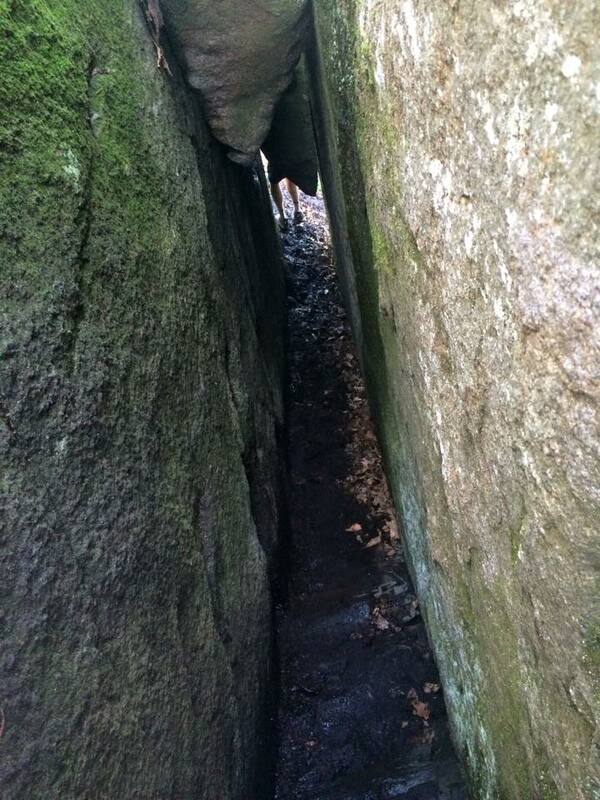 Fat mans squeeze is something I had always heard about and was excited to see. All of the following pictures are different views of the same rock formation. 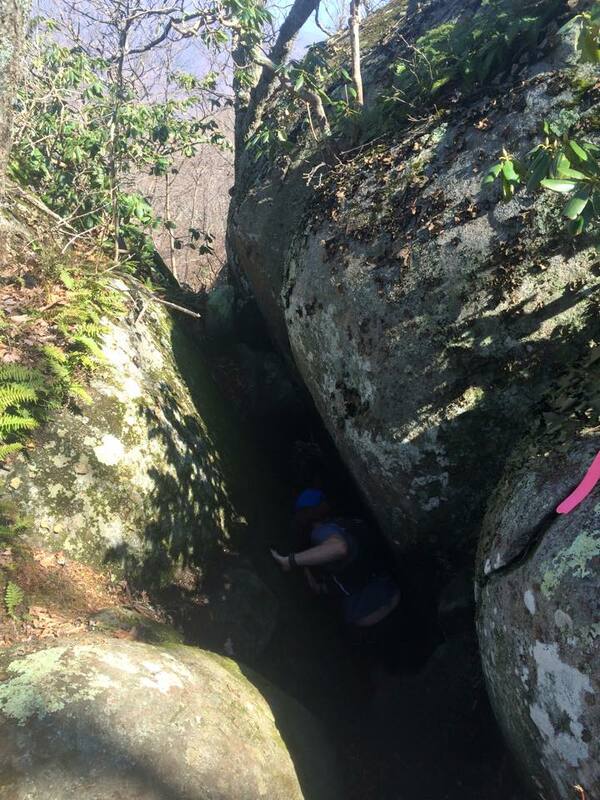 I got through the squeeze and soon came up on a short but rough section of rocks. It was football size rocks on top of rocks It was really hard to walk safely over them. The rest of the way was nice single track trail. Water crossing within last few miles. It felt great on tired feet! There no big climbs, but my endurance was low. I walked the uphills and jogged the downhills. I finally came out on the road, then on to the finish I saw that I could make under 7:30 and did. I crossed at 7:28. I was the last of my friends to finish, but they are all really good runners. I just wanted to finish, which I did. We got a nice Patagonia finishers shirt! 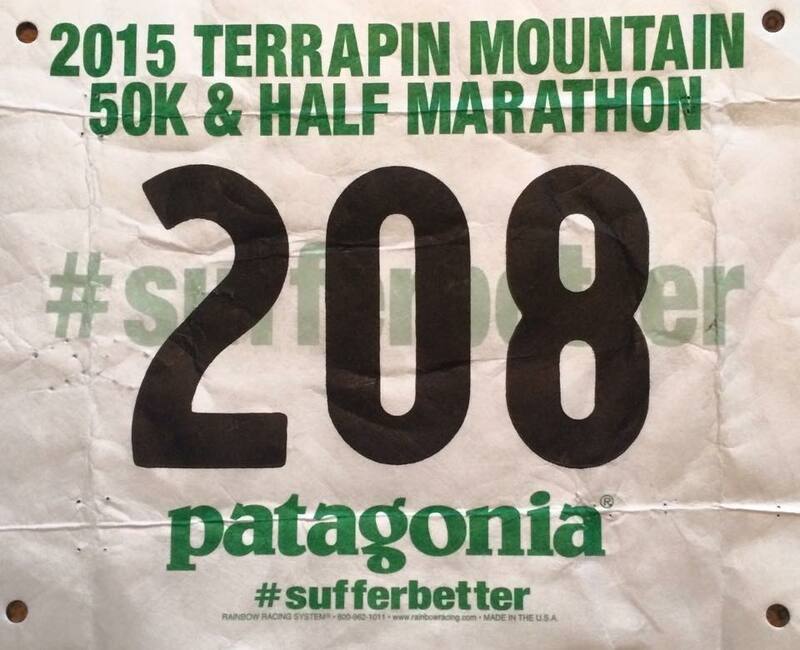 Categories: adventure, outside, Running, Trail, Trail racing, Trail running, Trailrunning, ultramarathon, virginia | Tags: 50k, terrapin, terrapin mountain 50k, trail racing, trail running, ultra, ultra marathon | Permalink.